The Siamese cat is from the past till today a very popular breed. More then hundred years ago the first Siamese were imported from Siam (Thailand) to England. The appearance of the Siamese has changed. But the type of the first Siamese we saw in England till about 1960 are still present. All over the world breeders has started to preserve the Old-Style Siamese and a growing number of organizations recognize the traditional Siamese or Thai as a "new breed" with their own breed standard and registration papers. Also in Holland a group of fanciers/breeders has specialized in the traditional Siamese . The "Werkgroep Traditionele Siamezen Nederland" intents to promote and protect the original shape of the Siamese, develops a breeding schedule and a breed standard in the Dutch language. Starting-points are Healthiness, Character and the traditional Siamese exterior. 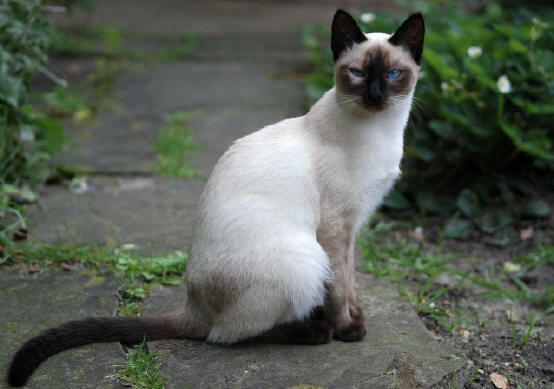 Although the breed standard permits all Siamese colors, the Dutch breeder wants to develop first the classic Siamese colors seal- chocolate- blue- and lilac points. For this breeding schedule we use exclusively traditional Siamese or Thai registered Siamese. For that we use also cats imported from country’s which never had a development for the Siamese Cat or from breeders that has bred aware the Old-style Siamese. Often has this breeder not visited a show for a long time and it happens that they don’t have an official pedigree for the cats anymore. The WTSN breeder goes with a Siamese like this to a cat show in the "Determination Class". Than they can get a "Registration Card" as a Thai or traditional Siamese if the cat looks like the Old-style Siamese. After four generations the traditional Siamese gets a Pedigree again. Of course this development and acceptation of the traditional Siamese by National and International Cat Club Societies and Associations has to be with good deliberation. Breeder shall not breed in a professional way. The WTSN allows breeding in small proportions. So non-commercial keeping and breeding of cats without the intent to make money, etc. With the concern of the health of the cat it is important to wait 12 months between two litters of one queen. Breeder endorses “ breeding in the width”. This means trying to breed with more queens and studs than is done till now. The WTSN there for stimulates breeders not to have litters in a structural way and trying to use young studs more and shorter as stud. All of this under the guidance of the WTSN and under responsibility of the cattery. Early castration (castration before 13 weeks of age) isn’t allowed without deliberation of the WTSN and new kitten owners. Placing a stud on the website of the WTSN only happens after deliberation of the WTSN, also when a stud is only used for a short period of time. Kittens born out of a combination of which the stud is unknown or not accepted by the WTSN, can be refused for the kittenlist of the WTSN. A mating between a WTSN queen and a non WTSN stud must always be deliberated with the WTSN. Breeders will not do inbreeding or line breeding (a crossing between closely related cats such as: father/daughter, mother/son, brother/sister, cousins, etc.) Our ambition is to have a 4 generation pedigree in which no inbreeding/ line breeding is done. But we will also look at double names in the last 10 generations of a line. You can ask advice about inbreeding of certain combinations and ask for alternatives. The WTSN has pedigrees from over 30.000 cats. The inbreeding calculation of “Ancestor Loss Coefficient” will, for the time being, be used to advise or discommend certain combinations with a short pedigree line (lots of empty spots in a line). A minimum “ancestor loss coefficient” of 85% (meaning a maximum loss of 15%) in a 6 generation pedigree (62 possible ancestors) is what we work with at this moment. We will also look at common ancestors of a combination, in total 500 ancestors from both sides. The advice is to at least stay under the 10% common ancestors. (Source: “Hundezüchtung in Theorie und Praxis” by Walter Schleger and Irene Stur). Both Queen and stud have to have a legitimate FeLV and FIV test (not older then 1 year, but we recommend not older then 6 months) The queen needs to have a vaccination for feline panleukopenia (distemper), feline viral rhinotracheitis and feline calicivirus for at least the time of her pregnancy. Breeder lets kittens grow up in the living room, with other pets and humans. Breeder is to tell new kitten owners about the personality of kittens and how to take care of a kitten and all other relevant information. Breeder has to be open and honest about breeding problems and must on her own initiative tell the WTSN about risks, (inherited) abnormalities etc. Breeder has to tell the new kitten owner about abnormalities or defects concerning health or looks of a kitten or the possibility for the kitten to develop them later in life. Breeder uses the standard Kitten contract of the WTSN to sell a kitten. Breeder detains the prices for kittens and stud matings as they are determined every year by the WTSN.